The head teacher leading a 200-strong school protest against Northamptonshire County Council’s proposed funding cuts wants councillors to reject the rescue plan tomorrow (Tues) because he says it will have a big impact on education. Tom Rees says Northamptonshire County Council’s rescue plan to save £65m is the ‘straw that broke the camel’s back’ after a few years of national and local cuts have hit the county’s schools. 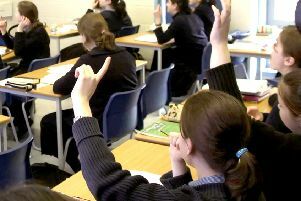 More than 200 school leaders have signed a letter hitting out at the cuts which target Special Educational Needs funding and home-to-school transport, with more signatures being added by the hour. Mr Rees, who is head at Simon de Senlis Primary School, said: “Today, the education community in Northamptonshire is saying that children and families deserve better. The current situation is a huge distraction for teachers and school leaders who should be concentrating on teaching and what takes place in the classroom every day. “There is widespread dissatisfaction from the Northamptonshire education community who feel that schools are already operating without sufficient funding to provide the quality of education that children deserve. “The additional cuts to children’s services laid out in the NCC stabilisation plan will create further significant challenges. Cabinet members of the ruling Conservative Party will be deciding tomorrow whether to adopt the stabilisation plan which is attempting to steady the council’s finances. The plan has been put together by the council’s new chief executive Theresa Grant and overseen by the two Government commissioners overseeing the county. Mr Reese said the letter took off over a few hours on Friday afternoon. He said: “The letter was originally drafted between a relatively small group of headteacher colleagues who were expecting perhaps 20 or 30 signatories. Within three hours this had attracted support from over 150 headteacher colleagues. These include leaders from nurseries, colleges, CEOs of multi academy trusts and the Vice-Chancellor of the University of Northampton Nick Petford. Leader of Northamptonshire County Council Cllr Matt Golby said: “These are unprecedented times for us and as such we have a plan to address the financial challenges we now face. “The stabilisation plan published alongside our latest financial reports show how we are now moving firmly towards stabilising our budget position. “However, we are of course acutely aware that the challenge to deliver this plan is significant and as such we will now focus all our energy on doing so.